Playing with Papercrafting: The Wilderness Awaits...Again! Well, one more sleep, Stampers! One more sleep until we can order from the new 2016-17 Annual Catalogue from Stampin' Up! Eeeek! I can hardly wait because there are some majorly epic products that I wasn't able to order from the preorder, and I am dying to get my hands on them. I'm also running out of products to use that aren't expired, especially Designer Series Paper, so it can't come soon enough for me. It will take a week for them to arrive though, so I'll have to continue to muddle through until then. Thank goodness for the Designer Series Paper Stacks in all of the colours, otherwise I'd have trouble! When I do a Mom and Me class, I usually structure it so that the moms and their kids work together on one project, then I take the kids off alone to make another simple project that they won't need their moms for and I leave the moms to chat together and complete another fairly simple design that they can do without my guidance. Yesterday, you saw the Together Time projects I have planned for the Mom & Me class. 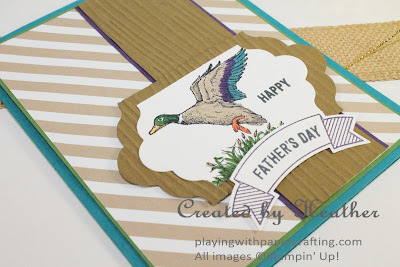 Today I'm sharing the card the kids will be making for their dads. 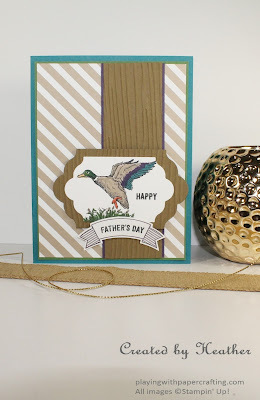 This is one stamp from The Wilderness Awaits stamp set that I haven't used yet. I thought it would be an image that the kids would have fun colouring with Stampin' Write Markers. I used Garden Green, Island Indigo and Elegant Eggplant for the head and wing feathers and the rest of the body is Crumb Cake. The feet are Tangerine Tango and the beak is So Saffron. I tried to mirror those same Regal and Neutral colours in my choice of papers. The Crumb Cake stripe is from the Neutrals Designer Series Paper Stack and it's backed by Garden Green cardstock. I embossed some Soft Suede with the Woodgrain Embossing Folder, but backed it with Elegant Eggplant cardstock. The base is Island Indigo. 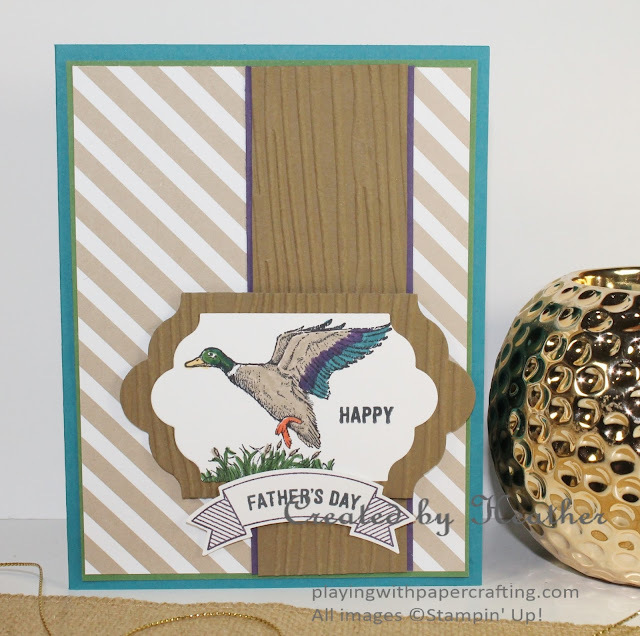 The labels with the duck and it's backing piece are die cut using the Lots of Labels Framelits. The sentiment is from the new set, Thoughtful Banners. 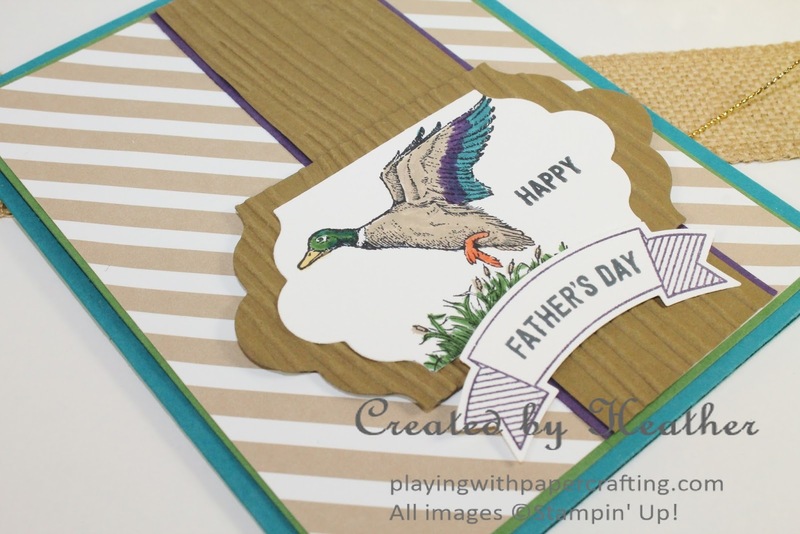 You can make almost any sentiment you want from that set and the great banners you can add them to are easily punched with the coordinating Duet Banner Punch. This might be a card you could easily duplicate for your Father's Day recipients! Well, it's come down to this! Your last day for ordering any of the retiring products from the old Annual Catalogue (2015-16) and the 2016 Occasions Catalogue. Have you got everything you wanted? If not, please get your orders to me by 5:00 pm today, or place your own order online until 11 pm tonight. Here's the link to my Online Store. Tomorrow, I'll have the link to the Catalogue posted for you and you can place your orders starting at 2 am - not that you'd want to start that early. They're already predicting some back orders on a few items, like the Pop of Pink DSP and Washi Tape.